Premier Annastacia Palaszczuk and her incumbent Labor party have fired the first renewable energy salvo ahead of the looming Queensland state election on the 25th, promising $150m to support new large-scale renewable generation and solar power in schools as part of their Powering Queensland’s Future plan. Premier Palazczuk announced the Powering Queensland’s Future Plan on Sunday while she was touring the Clare Solar Farm project in Ayr (in the Burdekin electorate which is currently held by the LNP). It includes $97 million for solar schools, a huge $50 million down payment for a new solar thermal power plant, $3.6 million to decarbonise remote communities, and a $1 million study for renewable solutions for the Daintree. Under the plan, the Government will establish a new company called CleanCo which will be mandated to deliver 1000MW of renewable energy in Queensland – with a special focus on flexible and dispatchable renewable energy (e.g. portable solar power). According to the Brisbane Times the funds would support a pipeline of $20 billion in proposed investment and it’ll create up to 15,000 full-time jobs, situated mostly in regional Queensland where unemployment is higher than in the cities. 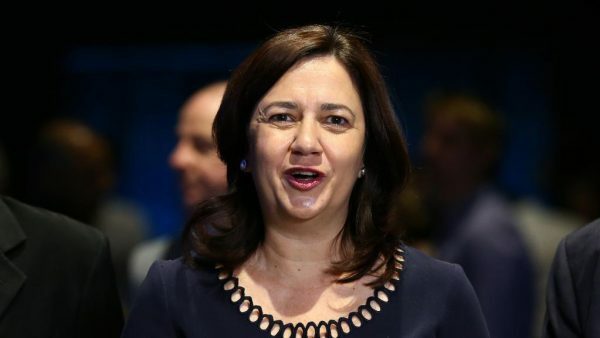 “We are committed to our transition to at least 50 percent renewable energy in Queensland by 2030,” Premier Annastacia Palaszczuk said. This is in stark contrast to the LNP’s plan to scrap the RET (Renewable Energy Target) if they are elected, believing that it’s time for the free market to decide on renewables vs. fossil fuels via their ‘Cheaper Energy Policy’. According to Labor’s policy, “Funding was cut (under LNP) for the Solar Dawn project, which would have delivered Queensland’s first solar thermal plant near Chinchilla, along with investment and job and training opportunities in regional Queensland,” calling the Newman-Nicholls government “complete renewable energy blackout”. Opposition Leader Tim Nicholls called the policy “more subsidies for more renewables that are going to cost jobs in regional Queensland”, and noted that they think baseload power is more reliable. Renewable energy jobs in Queensland double. Fotowatio Renewable Ventures (FRV) has been approved to build two North Queensland solar farms in Clare and Tieri – to bring another 141MW of solar power to the sunshine state. According to the Daily Mercury, the Tieri project will create 200-250 jobs during its development. It is a 96MW DC solar farm and will join another FRV farm in the same region – the 125MW Lilyvale Solar Farm. With the additional approval of the 45MW Clare II Solar Farm in Burdekin (which will be constructed next to the Clare I solar farm) these two projects (Clare II and Tieri) will add 141MW to FRV’s current 281MW portfolio of solar farms in the approved, but planning stages. It’s going to be a big 12 months for solar farms Australia wide, but especially in Queensland where there has been a flurry of recent approvals (e.g. the mega solar farm at Bouldercomb, an smaller Longreach Solar Farm and many more). RenewEconomy data shows that there are 17 solar farms currently being built (or having reached financial close) in Queensland alone – and there are at least another 34 currently being planned. FRV Australia Managing Director Cameron Garnsworthy said: “These recent planning approvals build on FRV’s track record of successfully working with local communities to achieve positive regulatory endorsement for its utility-scale solar projects”. They’ve previously been responsible for the succesful design and development of the Moree solar farm, the Royalla solar farm (both in New South Wales), and, as previously mentioned, the original Clare solar farm which is currently being upgraded. They have a proven track record overseas as well – FRV is a global developer of solar projects who have built utility-scale plants in locations as diverse as Jordan, Uruguay, India and Italy. You can click here to read more about the existing 125MW Clare Solar farm which will potentially reach 150MW in its final design (On May 31 FRV sold it to Lighthouse Infrastructure and DIF who acquired a 50% equity interest each in the project).